So What Was One Inspiration for Star Fox? 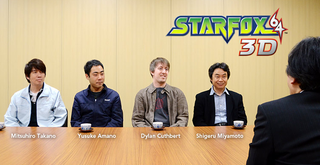 Well, there was a fox temple Star Fox developer Dylan Cuthbert told Kotaku about. But that's not all. The game was also inspired by British television. In a recent Nintendo interview, both company president Satoru Iwata and Mario creator Shigeru Miyamoto professed their love for 1960s British puppet show Thunderbirds. Miyamoto admitted that licensing Thunderbirds for a game would have been a "dream", adding, that he even had fantasies of Star Fox being so successful that Thunderbirds co-creator Gerry Anderson would come to Japan from the UK to turn the game into a TV show. "So for Star Fox 64, even though we would usually want the character animation to look natural, we had puppets in mind, so the characters' mouths pop open and closed." Thunderbirds debuted on British TV during the mid-1960s, and did get a feature film version in 2004. Anderson is currently working on a CGI version of Thunderbirds, which doesn't sound nearly as neat as a puppet Star Fox send up.